People who practice self-awareness are more effective, happier and more fulfilled. Teams who score high in EI are more productive and more trusting. Likewise, high performance teams collectively have higher EI. There is a deficit of self-awareness in the population. Although a majority of people think they enjoy high awareness only a handful of leaders actually exhibit strong self-awareness. Emotional Intelligence, as a psychological theory, was developed by Peter Salovey and John Mayer. It became a household term with the ground-breaking book, Emotional Intelligence: Why It Can Matter More Than IQ, by Daniel Goleman in 1995. Travis Bradberry further developed the EI concept with the introduction of Emotional Intelligence 2.0 and a corresponding survey offered through Talent Smart. "Emotional intelligence is the ability to perceive emotions, to access and generate emotions so as to assist thought, to understand emotions and emotional knowledge, and to reflectively regulate emotions so as to promote emotional and intellectual growth." From the definition above one can see how self-awareness is essential to the ability to perceive emotions. Ironically, most people are hardly aware of the emotions that drive their behaviors. Supporters of EI reason that the more awareness around emotions one has the more resourceful one can be. Bradberry illustrated the connection between awareness and regulation within oneself and also in social settings. Recent research shows that we can move the needle on our own awareness level and emotional intelligence. 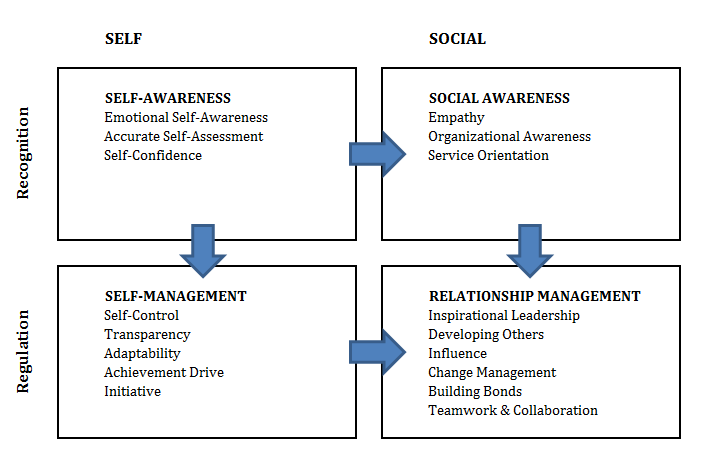 Viewing the figure below we can see how self-awareness is not only key to recognition and regulation, it is also the first step to social awareness and management (including inspirational leadership, teamwork and collaboration). All aspects related to emotional intelligence begin with self-awareness. Building self-awareness is not easy. It's not an external action like finding the right person or right productivity tool. Developing self-awareness is an internal process that takes hard work and for the Global Creative, building self-awareness can be a counter-intuitive process. ADHD disrupts one's ability to generate accurate awareness and regulate one's thinking and actions. ADHD and related executive function challenges actually inhibit our ability to build awareness and ultimately boost emotional intelligence. Simply stated, the entrepreneur whose posture is one of action often gets resources that are external to himself - a new employee, a process like Lean Principles or a productivity tool. EI and development of self-awareness take a different posture, one of curiosity and reflection, not exactly the traits of goal-oriented professionals. So what is the Global Creative to do? Just because practicing self-awareness is harder with ADHD doesn't mean you shouldn't try it. Lidia Zylowska and her group at UCLA have discovered that practicing mindfulness helps to better manage ADHD symptoms. Imagine that! Strengthening self-awareness not only can make you a better leader. It can also help to manage your ADHD! Pause - Developing EI starts with developing self-awareness. Awareness begins with a pause. The practice is so simple it tends to slip off the radar. It is also the executive function mechanism Global Creatives struggle to engage on a regular basis. Practice tapping the brakes and you will get better. I have. Practice meditation - Commit to a regular practice. Many of my clients like to meditate in the morning and link the practice to journaling and exercise. Join a class. The social aspect will boost accountability. Subscribe to an online program. Tara Brach and Thich Nhat Hanh both have excellent material. I use an app called Headspace and I use it with one of my kids. It's great for guiding the process and it's a lot cheaper and more convenient than a class. 5 minutes a day can make a difference. Journal - Journaling is an exercise in reflection. Reflect on completions and note what you are grateful for. Commit to a daily intention - Set an intention in the morning then reflect on the experience at the end of the day. What made it successful? What got in the way? Spend time with people who value self-awareness - They are out there. They tend to manage drama well and surround themselves with other individuals who value awareness and emotional intelligence. Finally, don't put mindfulness practices in the margins of your day. Those who see the value of reflection and awareness will place practices like strategic planning and reflection at important inflection points of their day and never make it optional.